Edging near the top of my bucket list, was an adventure that is completely out of my comfort zone. I wanted to volunteer at Growing Power, Will Allen’s urban farm in Milwaukee. If people can grow safe, healthy, affordable food, if they have access to land and clean water, this is transformative on every level in a community. I believe we cannot have healthy communities without a healthy food system. Twenty years ago, Mr. Allen took an old run down nursery with a few greenhouses in a neighborhood that didn’t have access to fresh food and started growing things. 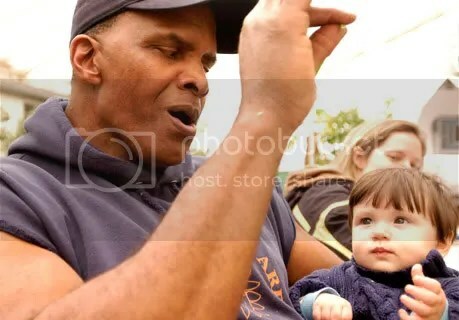 More than growing food, he has allowed people who visit, volunteer, purchase food, and work there to experience a food system that has been slowly slipping away from our way of life. Last Saturday, we (Steve and Deanne) showed up at 10 AM for their weekly free volunteer tour. 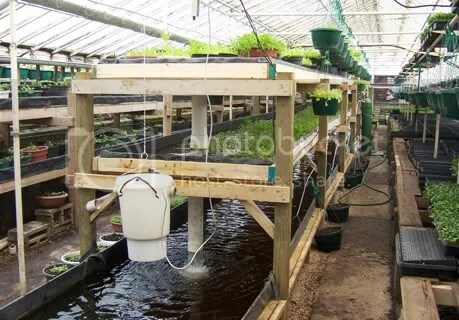 The tour lasts thirty minutes and covers the greenhouse operations, soil making operations, and a visit to other areas outside the greenhouses. Rather than tell you about the tour, I recommend you visit for yourself. If you are closer to Chicago, Growing Power now has operations there also. 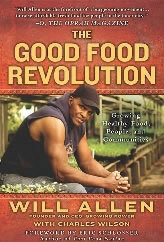 If can’t visit, check out his book The Good Food Revolution. Volunteering at a farm is out of my comfort zone because electronic gadgets are about the only tools I utilize. After the tour we asked for our assignments and the tour guide suggested we work in one of the greenhouses and empty pots of soil and gravel. Wheelbarrows and hand shovels showed up just like magic so we could empty pots from one greenhouse by separating the soil into one of the wheelbarrows and the gravel into buckets. When we finished that chore, we scrubbed the pots clean so they would be ready to use again. A sign of strong leadership is when things get done when the leader isn’t around. The leader attracts people with their strong sense of possibility or vision and then discovers the passion in the people that show up. Finally the leader, with the help of a team, sets up systems and gets mostly out of the way so the people can shine. We didn’t see Mr. Allen, but his team had a sense of purpose in their work. We wished we could have eaten at Growing Power’s MLK Cafe which is in another location. I see from the website that DeShawn Parker is the chef. His inspirational life story is told in the book. It would be my guess that having a cafe in a neighborhood that needs access to food with a chef who grew up in the Growing Power community is an example of the organization’s simple goal playing out: to grow food, to grow minds, and to grow community. Have any non-farmers like me ever volunteered at a farm? If so, it would be great to hear about your experience.